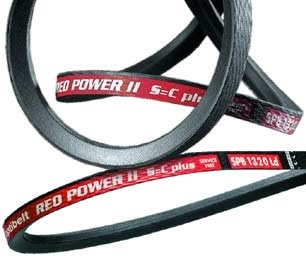 Optibelt RED POWER v-belts feature a high modulous tension cord for a 50% increase in power capacity and no re-tensioning maintenance. It's transverse fiber rubber compound increase the belts capacity to dissipate heat and stabilizes the belt in the sheave for up to 97% efficiency and increased durability. Features Optibelt's Set-Constant length tolerances that are far closer than any matched set, regardless of the date manufactured! " MATCHED-SETS: Optibelt's exclusive S=C PLUS length tolerances ensure the most acurate length tolerances, regardless of the date manufacutured. HEAT RESISTANCE: Increase capacity to dissipate heat for substantial inceases in durability and belt life. POWER: Increases power capacity by up to 50%"